There’s a lot of talk these days about the importance of corneal thickness when considering LASIK eye surgery, but what does it really mean and how important is it in determining candidacy for LASIK? Although it’s not the only factor used to determine LASIK candidacy, corneal thickness is definitely an important one. LASIK is a corneal procedure. During LASIK laser vision correction, once the flap is created and gently peeled back, microscopic amounts of corneal tissue are removed with the excimer laser. The amount of corneal tissue to be removed is calculated based on the patients prescription. Generally speaking, for every diopter of nearsightedness, 12.5 microns of corneal tissue need to be removed. Our measurements are more precise than this, measuring the thickness underneath the LASIK flap to the quarter of a diopter. That said, to approximate the amount of corneal tissue necessary for a patient to be considered a candidate for LASIK, 12.5 can be multiplied by the patient’s dioptric power. For instance, if a patient has a -5.00 (diopter) power, approximately 62.5 microns of corneal tissue need to be removed to correct that specific prescription. In addition to this, the thickness of the LASIK flap needs to be taken into consideration as well as the amount of tissue that should be left intact on the corneal bed. 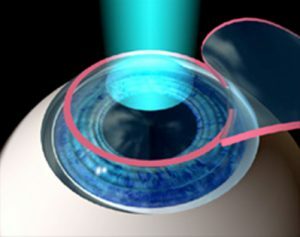 Dr. Mandel uses only ultra thin corneal flaps created with the IntraLase laser. His flaps are approximately 100 microns, as compared to other centers who use a microkeratome (an oscillating blade) which create thicker flaps, usually between 140 to 180 microns. How is corneal thickness measured? During this method, once the eye is anesthetized, an ultrasonic probe is placed on the cornea. This probe transmits high frequency sound pulses into the eye. The pachymeter measures the time it takes for the sound waves to be reflected back to the probe after traveling through corneal tissue. Several spots on the cornea are measured to ensure the cornea thickens uniformly from the center of the cornea to the periphery. This procedure takes approximately 5 minutes for both eyes. During this method, there’s no need for the eye to be anesthetized as there is no contact with the cornea. This method of measurement is considerably more sophisticated than pachymetry, gives a lot more information and is now considered the gold standard for corneal thickness measurement prior to LASIK eye surgery. The Oculus Pentacam® is a combined device made up of a slit illumination system which cross-sections the eye and a Scheimpflug camera which rotates around the eye. The multiple images obtained are combined to generate a 3-dimensional representation of the patients cornea which includes the corneal thickness with a precision that was previously unattainable. Click here to read more about Pentacam technology. Again, corneal thickness is not the only factor used to determine candidacy for LASIK. There are many factors to be considered when determining whether LASIK is a recommended procedure. This is why candidacy for LASIK can only be determined by a LASIK specialist. If you’re tired of the hassle of contact lenses and glasses and would like to find out if you qualify for LASIK, call us at 888-866-3681 to schedule a free LASIK consultation with corneal specialist and micro-surgeon Eric R. Mandel, MD. Or, you can click here to schedule your consultation online.